You’re only as old as you feel, or so the saying goes. 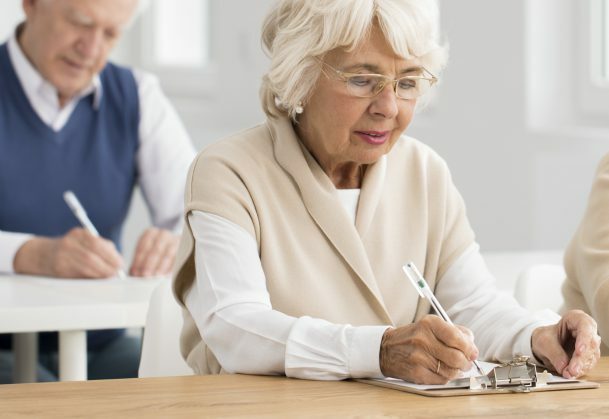 Now, research suggests that a simple memory test can have a noticeable impact on just how old some older adults feel, aging them about five years in the span of five minutes. The findings are published in Psychological Science, a journal of the Association for Psychological Science. Given stereotypes that associate aging with memory problems, Geraci and graduate students Matthew Hughes and Ross DeForrest hypothesized that having to take a memory test would highlight age identity for older adults, making them feel older than they would otherwise feel. In their first study, the researchers recruited 22 older adults ranging in age from 65 to 85 and asked them to indicate how old they felt on a line marked only with endpoints of 0 and 120. The participants were then given a brief test that assessed various aspects of cognitive functioning and a memory recall test. The participants then indicated their subjective age on the line one more time. At the beginning of the study, the participants reported feeling about 58.59 years old, considerably younger than their average chronological age of 75.05. After taking the memory test, however, their subjective age increased to an average of 63.14 years old, almost 5 years older than their initial report. Further studies showed that the effect was specific to older adults and to memory tests — there was no aging effect for younger adults or for older adults who took a vocabulary test instead of a memory test. A final study revealed that the memory test itself isn’t necessary to elicit the effect: Simply reading the instructions for the memory test was enough to induce a subjective aging effect among older participants. “This research shows that simply putting an older adult in a memory testing context affects how they feel about themselves,” says Geraci. Notably, participants didn’t show any actual memory problems, suggesting that it was their perception of their ability — rather than their actual ability — that affected how old they felt. Geraci and her students are currently looking at other sorts of activities that influence subjective age, and they’re also exploring whether there are some tasks that actually make older adults feel younger. This makes me think of the impact of portrayal of aging in our culture, societal norms and expectations that with age comes deterioration. And while it is true, aging comes with the maintainence of loss, why don’t we also focus on learning and continuous growth?